Glasgow full-back Peter Murchie insists the international break was no excuse for his side's defeat by Scarlets. Warriors were without 17 players for the Pro12 match in Wales because of international call-ups, but Murchie is adamant they still had the talent to win the match. "It might have been a different team if everyone was available," he said. "But we still felt we had a side that was capable of winning and we didn't play well enough, or to our potential." 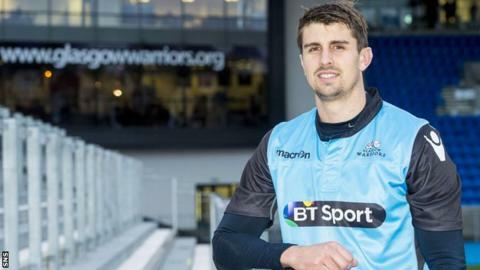 Glasgow are fourth in the Pro12 standings and 28-year-old Murchie believes it is vital they "bounce back" when Newport Gwent Dragons visit Scotstoun on Sunday. "It's a massive game," he told BBC Scotland. "It would've been a big game anyway, but when you lose a game, you often get a massive amount of learning from it. We had a pretty tough video session and we've done a lot of learning. "It's a massive squad game nowadays, all the teams have big squads, and we really believe we have strength and depth in ours, but we let ourselves down a little bit on Friday." "It's important we put that into place during training this week and then have a massive reaction on Sunday. "I think four of our next five games are at home, so it's an opportunity to start building some momentum. "We're still right in the mix and, while it's a setback, hopefully it will just be a minor one if we can put it right on Sunday." Glasgow losing 17 players sparked a debate over whether leagues should shut down when internationals are played, but Murchie reckons that is an unlikely scenario. "The season would have to run a lot longer if you were going to do that then you get into summer tours," he added. "As it stands, I don't see how they could do it. "It's a massive squad game nowadays, all the teams have big squads, and we really believe we have strength and depth in ours, but we let ourselves down a little bit on Friday. "The guys who are staunch supporters still want to see some rugby on Fridays, Saturdays and Sundays. They still want to see their clubs."